Olivia is as cute as she is uplifting. She's always in a good mood, always ready to play, and always ready to share her exuberance with others. Call it super large, super grand, positive thinking for preschoolers! 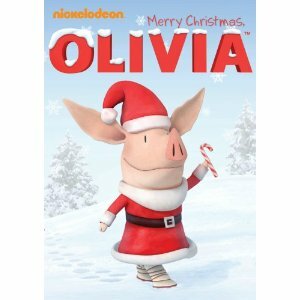 Olivia is ready to share her joy for Christmas in her new DVD Olivia : Merry Christmas, Olivia! There are 94 minutes of holiday themed Olivia goodness included on this dvd and eight episodes! Olivia ClausIt’s almost Christmas, and Olivia and Ian can’t wait for Santa to come. But there’s one thing that Santa can’t bring – Olivia’s lost toy, her beloved monkey Mathilda. Olivia imagines herself to be a Santa Claus who returns lost toys. On Christmas morning Olivia finds new gifts under the tree and Mathilda right under her nose. Olivia and The Family PhotoMother is determined to take the perfect family Christmas photo – in the middle of the summer. With the help of a snow machine, Olivia takes it upon herself to bring a little Christmas spirit to the photograph, and to Francine’s backyard beach party next door. Olivia's Ice SpectacularOlivia can’t wait to see skating star Sonja Spencer perform in “Cinderella on Ice.” She’s sure she’ll be the lucky audience member chosen to skate with Sonja, and begins practicing on the skating rink she makes in her own backyard. When the show is canceled, Olivia decides the show must go on and she and her friends stage their own ice spectacular. Olivia's Snow DayIt’s a snow day and school’s closed. Olivia takes to the snow-covered streets with Julian as her cameraman, to report on all the snow day happenings. The biggest story of the day turns out to be an alleged sighting of the legendary abominable snowman. Can it be true? Olivia tracks down the real story. Olivia Makes a Wedding GiftOlivia’s favorite art teacher, Miss Davis, is getting married, and Olivia wants to find her the perfect wedding present. But despite all of her fundraising efforts, she only has enough for a very small gift. With help from her classmates, Olivia creates a very special card for Miss Davis to go along with the gift. Olivia Makes MagicAfter seeing Grandma perform an impromptu magic show, Olivia begins practicing her own magic tricks. She doesn’t have much success, until she manages to make herself “disappear” for Ian and Julian. They can’t figure out how she’s done it, but Ian doesn’t care. He just wants his big sister back! After noticing all the great compliments Mother receives on account of adorable baby William, Olivia finds herself some babies of her own: her cat Edwin and her dog Perry. Being a mom is tougher than it seems, but when Mother asks Olivia to watch William for a minute, her new skills come in handy. Olivia is determined to sell more Young Pioneers cookies than anybody else in her troupe – especially Francine. It turns out to be harder than she thought it would be, but with a little perseverance and ingenuity, Olivia manages to do her personal best. You know I will say it's pretty hard to resist Olivia and her constant upbeat attitude. I absolutely love how Olivia fosters imagination skills in her viewers and really encourages kids to think big! Olivia : Merry Christmas, Olivia! is available right now on dvd and you can pick up your copy on Amazon! Disclosure: We were given a copy of Olivia : Merry Christmas, Olivia! free of charge, we were not compensated for this post in any other way. My opinions and comments on items we review are always my own and are never influenced by sponsors.